It was with some trepidation that I started reading Last Regress as I am usually far too scared to read horror. However, from the very start, with the very effective prologue, I was hooked. The craftmanship of the writer is evident from the way she draws you in as each layer of the mystery unfolds. It was the mystery of the story that had me totally enthralled making me not want to stop reading until I had got to the end. In fact, the horror elment is only a small part of the novel, it is so much more than that. The descriptions of the paranormal were so convincing and it was clear that the writer really knew her stuff. The novel is both thoughful and thought provoking and I found myself questioning my own beliefs throughout. The main character in the novel, Alyssa Matthews is wonderfully crafted, all at once funny, vulnerable and unconventional. I loved her. I would recommend this novel as having something for everybody. It is compelling and original. 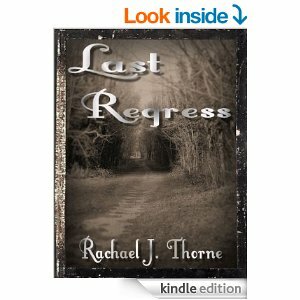 I am now awaiting Rachael J. Thorne's next novel. A fast paced unstoppable novel which had me hooked from the very opening lines. If you enjoy lots of action and exciting twists and turns then this is the novel for you. The female protagonists are fearless and fun, leaving you wistfully wishing they were real. It is well written and convincing but be warned once you pick it up you won't be able to put it back down again. And if you're stuck for a resolution yourself then why not set yourself the target of reviewing all the books that you read. It's actually more fun than you might imagine and it means everything to the independent writers who are trying to spread the word about their books.